After so much buzz in the last months, Apple has finally presented today its brand new device in San Francisco: a tablet called iPad. This is the official Apple's video. Everyone was expecting this kind of device. I have to admit that, at first sight, the device was not as groundbreaking as I was expecting. Maybe it is because my expectations after reading so much about it were so high. However, after taking a look at the presentation video, I have to admit that it looks pretty cool. And yes, it makes you want one. But Ithink that I DON't actually "need" it. 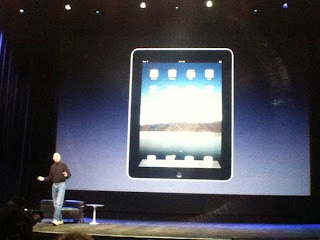 The iPad looks awesome to me for web surfing, movie watching and photo viewing. In these areas I feel like it matches and probably exceeds a laptop's capabilities. However, I do not see myself replacing my Macbook with a shiny iPad. Emailing, gaming and book reading are some of the other main tasks for which the device has been designed but I do not feel so strong about them. A physical keyboard is still important for typing (though the iPad's interface looks quite good); I feel like the PS3 and the Xbox of the world are a completely different world; and I still like the feeling of reading an actual book. You can check some articles about its features here. The design is definitely sleek and the claimed 10-hour battery life is promising. The ibook store and all the application universe are also appealing. On the contrary, there is no USB slot and the hard drive is not that big and can't be expanded, considering that it is intended for massive media consumption. Finally, I feel like the price is quite good, starting at $499. Cheaper than expected. In fact, many are pointing out that Apple's stock went up when Steve Jobs announced the price point.